3. Jr.Engineer/ Electronics - Three years Engineering Diploma@ in Electronics/Electronics & Comm/equivalent trade from a Govt. recognized University. For the post of Sr.System Analyst (post code-01), the selection methodology will comprise three-stage process – Written Test (two papers), Personal Interview followed by Medical examination in Bee-Two category. For the post of Jr.Engineers (Electrical/Electronics/Mechanical/Civil), (post codes 02,03,04 & 05) the selection methodology will comprise three-stage process – Written Test (two papers), Personal Interview followed by Medical examination in Aye-one category not below Aye-three. For the post of Maintainer, (post codes 06) the selection methodology will comprise three-stage process – Written Test (one paper), Personal Interview followed by Medical examination in Bee-One category. 1. 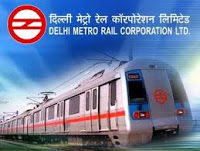 Candidates are required to apply online through website www.delhimetrorail.com. No other means/mode of application will be accepted. 3. Candidates are first required to go to the DMRC‟s website www.delhimetrorail.com and click on the link “Career”. 4. Thereafter, he/she may open the recruitment notification titled “DMRC/OM/HR/I/2013”. 5. Candidates are required to download the CASH CHALLAN (fee payment voucher) for payment of the application fee. The cash voucher is in triplicate. 6. Candidates are required to go to any Branch of State Bank of India and pay the amount of prescribed fees (for fee details see para “Payment of application fee”) per post. State Bank of India (SBI) has been authorized by DMRC to collect the application fee, in a specially opened DMRC Account No. 32091518042. The Online registration will remain active from 10.00 hrs of 25.04.2013 to 23.59 hrs of 16.05.2013 only.